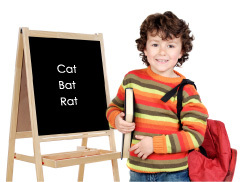 Outlaws helps children learn to recognize and spell words that do not follow short and long vowel rules. For example, one rule states that a single vowel in the middle of a word is usually short. Exceptions-told, cold, hold. Another rule states that the first vowel in 2-vowel words is usually long. Exceptions: bread, thread, head. Comical illustrations show children how to recognize "outlaw gangs" in words by noticing the vowels and letters that follow. Once the children have become familiar with the irregular words in this song, they can use the instrumental track to substitute their own outlaw words. Examples: 3-letter patterns-there, where; 4-letter patterns-could, would; 5-letter patterns-caught, taught. Take a look inside the book and listen to the song. Save on this book and others with one of our Book Collections or Literacy Center Collections.